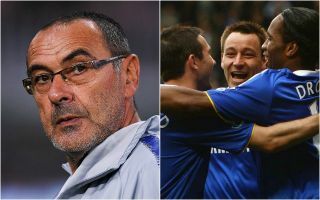 Chelsea manager Maurizio Sarri admits he’ll look to talk to John Terry again about a coaching role at Stamford Bridge as his future remains in doubt. The former Blues defender is currently a free agent after leaving Aston Villa in the summer, which itself came a year after he ended his long association with CFC. Terry had looked set to join Spartak Moscow before confirming on Instagram this week that he’d changed his mind about the move. It could be that Sarri will now have the chance to bring the former England international back to the club in a coaching role, though the Italian has stated his belief that his preference seems, for the time being, to be to carry on playing. However, Sarri told his press conference today that he would like to speak to Terry again after initial discussions about joining the backroom team. ‘I don’t know, the last time I spoke to him he told me that he wants to play for another season but I don’t know the situation I’m talking one week ago, Chelsea is his home of course,’ Sarri said at his pre-match press conference, as quoted in the Metro. Chelsea fans would no doubt love to have one of their best ever players back helping the team behind the scenes, though of course great players don’t necessarily always make it at coaching level.